The Gym Girl Ultra was designed with the busy woman in mind. 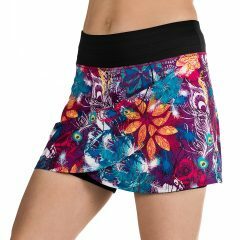 This Skirt is meant to perform and flatter while you go for long runs, practice yoga, play a round of golf and manage a career in between dropping the kids off at school, grocery shopping and coffee with the girlfriends. The built-in shorties have a pocket on each leg to stash your essentials. Designed by busy women for busy women. The Limited Edition Gym Girl Ultra colours do not have a waist drawcord. If you prefer a waist drawcord, head to the Gym Girl Ultra product listing.